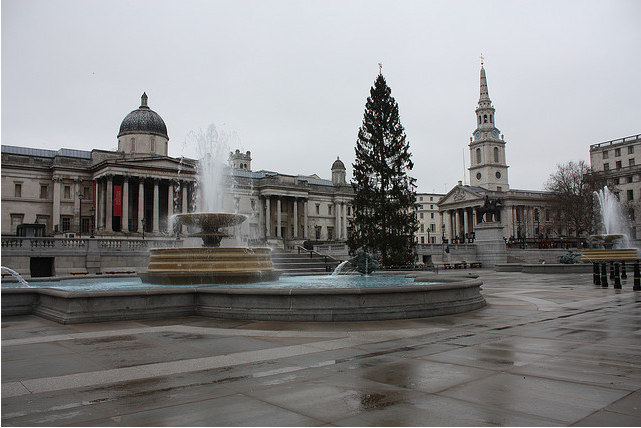 Trafalgar Square on Christmas morning. Get Nelson all to yourself. Public transport is taking a break, the shops are closed and London's cultural calendar misses a beat. But there are some things happening around town on Christmas Day. Here are a few ideas...feel free to highlight others in the comments. The Dickens House Museum opens 11am-6pm to celebrate Christmas Victorian style. Book tickets (£15, including refreshments...if mulled wine and mince pies can be described as 'refreshing') here. Places are still available for the central London guided walks organised by Westminster Guides. The hardy among you might like to try the 6am walk, a rare chance to see central London almost deserted. Other walks start at 10.30am and 4pm and cost £20 each. Two tours, following in the footsteps of Samuel Pepys and Charles Dickens, leave Trafalgar Square at 11am and 2pm, respectively. More info on the eccentric Walks.com website. For those who'd rather take the load off their feet (and their wallets), Sightseeing Tours London operate a Christmas Day Thames cruise including a traditional Christmas lunch. £132 per person. Those crazy foos at the Serpentine Swimming Club compete in the annual Peter Pan Cup, a race around the frigid waters of the Hyde Park lake. The chilly swim has been as annual fixture since 1864. Watch the action from 9am. LondonEats.com have already done the hard work and compiled a list of 18 London restaurants open on Christmas Day. All of them are in the West End. It's also a safe bet that several of the curry houses on Brick Lane will also be trading. Pubs.com has compiled a fantastic list of pubs open on Christmas Day. Quite a few are out in the suburbs. More central-ish options include the Bunch of Grapes and Founders Arms in Southwark, the Duke of Wellington in Notting Hill, the Last Running Footman in Mayfair and the Spread Eagle in Camden. You're advised to phone ahead to check, especially if you're after food. Most London churches will, of course, hold Christmas Day services. If you want to supersize your worship, try the St Paul's Midnight Mass (starts 11.30pm Christmas Eve), sung Eucharist at 11am or Festal Evensong at 3.15pm. Westminster Abbey has a Midnight Mass (11.30pm Christmas Eve) and Sung Eucharist (10.30am). OK, we lied when we said that there's no public transport on Christmas Day. Plenty of cabs and minicabs are still available for hire, and the Boris Bikes can still be enjoyed. Actually, if you're one of those people who's been meaning to give the bikes a try but are a bit scared of traffic, the empty roads of Christmas Day would be a good opportunity to get your nerve. Photo by Zefrog in the Londonist Flickr pool.